Colorful Aurora borealis, better known as Northern Lights, dancing above lit up mountains of the Brooks Range during a full moon night with many stars in the sky, Alaska. USA. There are many places to photograph dancing northern lights (Aurora borealis), one of mine all time favorite spots is the northern part of the Brooks Range in Alaska. I photographed this winter night scene in February. It was a icy cold night, full with stars in the sky. It was the ideal night to capture this northern light landscape scene because the full moon was lighting up the beautiful mountains of Brooks Range around me. I spent many clear nights on this location to capture the northern lights but this photo is one of my favorite one because of the intensity of the lights, the colors and the perfect lighting from the full moon. 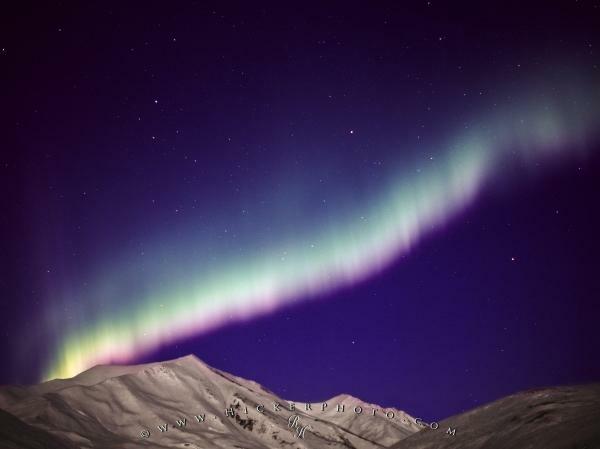 Photo of colorful Northern Lights dancing above mountain peaks of the Brooks Range, Alaska, USA. ... I was able to find a external battery pack which I was keeping close to my body at all times, otherwise I want to doubt that I would have gotten this photograph, especially during this icy cold night with around -45º degrees celsius (-49Fº). The photo was captured in format 4.5x6cm on Fuji Provia film, now scanned on the high resolution Hasselblad (Imacon) X5 scanner. Colorful Northern Lights (Aurora borealis) dancing above snowcapped mountains lit up by full moon, in the northern part of the Brooks Range in Alaska, on a icy cold winter night with a night sky filled with stars.